PorchFest Quincy 2018 - Squantum neighborhood. So you attended a PorchFest, and you're thinking about starting one in your town? Running PorchFest is a fantastic experience, but it’s a lot of work, and you may be wondering how to get started. You may be considering what neighborhood to get started in and when would be the best time of year to make it most enjoyable. You may have also done a napkin sketch of some creative logo ideas that capture the local charm of where you live. While it is essential to determine what you plan to do, for an effort like this to be successful, it is more important to start with why. This article is the first in a series about organizing a PorchFest, covering the various stages of design, planning, volunteer organizing, and community engagement, but we will begin where any successful effort should: What is your mission? Developing a clear mission statement will help motivate you through challenging times, share the vision with others, and prioritize your efforts. There will be setbacks along the way. You may run into concerns and potential resistance from neighbors, town officials, and local business owners who may not readily understand what you are trying to do. There will be times when the workload is challenging, and people who wanted to help may find they over-committed, leaving you to pick up the slack. Meaningfully connecting with why you are taking on this effort will help you stay committed and work through the challenges. You will need to explain what you are trying to do — a lot! While the PorchFest movement is spreading quickly across North America, there are many people you will speak with who will have trouble understanding the concept at first. You will need help and cooperation from others, and a clear mission statement will help you articulate and inspire others to invest in your vision. When more and more people get involved, they will generate a lot of great ideas — some practical and some a bit ambitious. You will undoubtedly consider a few ambitious ideas of your own. It is essential, particularly in your first few years, to prioritize what you are trying to accomplish. A clear mission statement will help you stay focused and prioritize the efforts that support your desired outcome. What makes up a good mission statement? State the purpose of why you and your team are assembled to take action. State the desired outcome your team seeks to achieve. Be clear and concise to enable memorization and internalization. "WGBH enriches people's lives through programs and services that educate, inspire, and entertain, fostering citizenship and culture, the joy of learning, and the power of diverse perspectives." WGBH employs a single sentence to help their team understand what they do and why they do it. A concise statement is easier to remember and is thus easier to internalize and use each day. As your team takes action, they can use this single sentence to remind themselves of their purpose when things get difficult. This same sentence can also help them make important decisions about how to focus their time, energy, and resources. 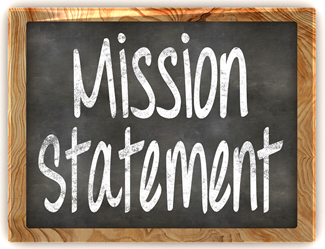 You wrote your mission statement, now what? Once you have your mission statement, use it! Incorporate your mission statement into all of your conversations, and give it a prominent place in the various mediums where you present your thoughts (print materials, website, etc.). WGBH does a beautiful job of integrating their mission statement. It is presented throughout their employee's work-spaces, incorporated into their organization’s media, and is even displayed prominently on the exterior of their building. Consistent and prominent implementation of a mission statement leads to greater memorization, internalization, and adoption among the team members. When team members are aligned and take ownership of a shared vision, it creates an invisible hand that guides their effort toward the desired outcome. "PorchFest Quincy celebrates local artists, our beautiful neighborhoods, and the people who live here while fostering a greater sense of community. Local Quincy band Who’s Down? performing at PorchFest Quincy 2018. The PorchFest Quincy team focuses on celebrating community through the shared experience of music. Music brings together people who might otherwise not have much in common. The entire PorchFest Quincy team knows what we are trying to achieve, and knowing it helps us make decisions and come up with ideas that support the mission. Most importantly, it helps to motivate us because it takes a lot of work to make it happen. Investing in a mission statement might seem like a bit of a formality, but it’s a critical first step that will genuinely pay off in the end. You will find it invaluable when you need motivation, share your vision with others, and struggle to stay focused on efforts that will turn your vision into a reality. Good luck!